It comes in two versions, and I made version 1. 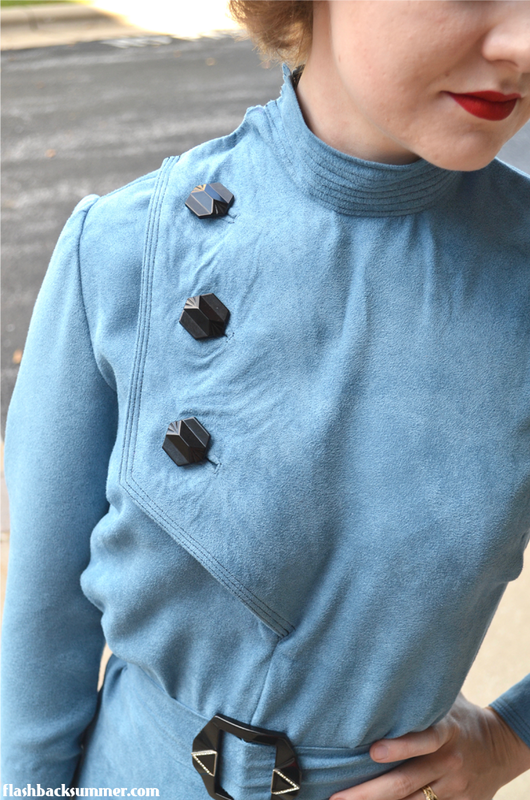 The pattern description says it is a military-inspired look, and that drew me to it even more. It definitely has the silhouette of a WWI uniform mixed with Art Deco lines, and it's such a unique combination. 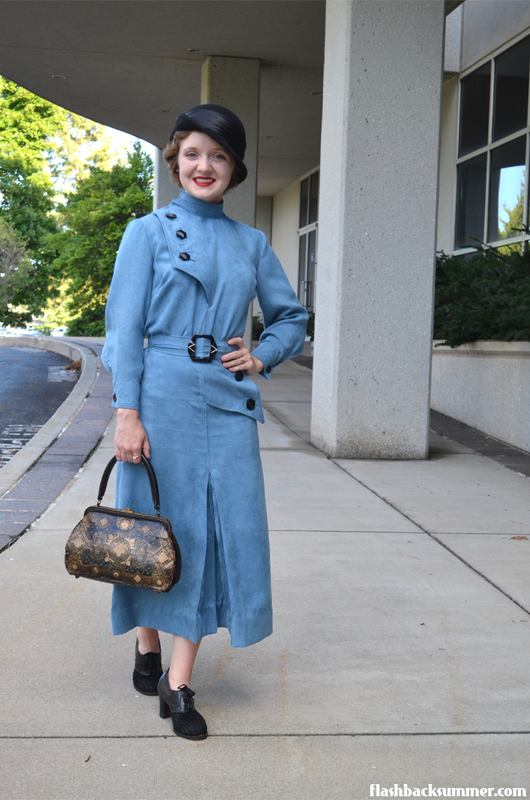 I especially love it because it's impossible to buy this kind of look anywhere right now; you really have to stumble across a true vintage piece or make it yourself. The instructions were clear for me as an advanced sewist, except for one step which I will elaborate on below. The only problems I encountered really didn't stem from the pattern; they came from the fabric I used. I found this polyester fabric on sale for $4, so I figured it would make a great winter dress. Polyester like this is terrible at any time of year except when it's cold, and the suede texture just seemed wintery to me. The low price made me feel good about this being a "wearable muslin" that, should it work out, would also fit well into my wardrobe. However, the polyester content made it nearly impossible to iron. This pattern has several sharp angles and interesting seams which don't appear as crisp on my version due to the polyester refusing to be tamed by any heat or steam level. There are also a lot of wrinkles, particularly where I blind-hemmed the facings to the insides around the cuffs, hem, and front facing. I pressed and pressed, but they just won't go away. I've decided to be alright with it, but I don't want it to be a reflection on this pattern! It's not the pattern's fault; it's all the dumb polyester. I was also surprised at how the sizing worked out. 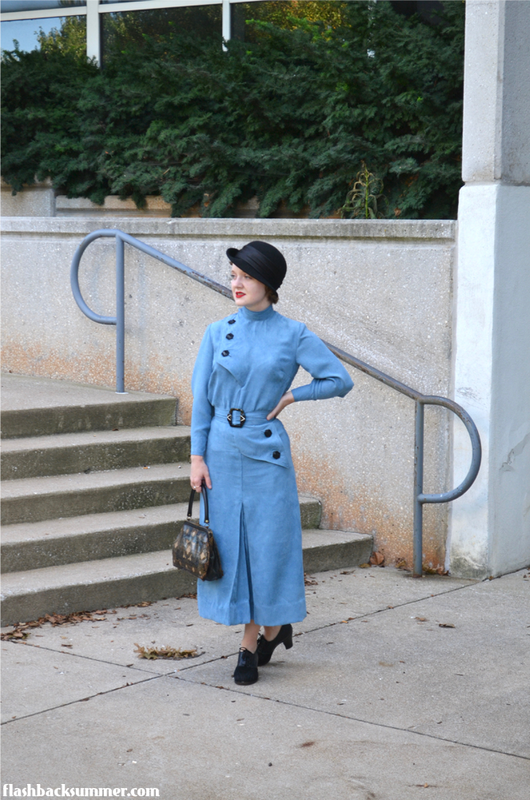 Wearing History patterns are "resto-vival" patterns, meaning they have been graded to a larger size range and may have very small tweaks in the pattern or instructions to make it clearer and better-fitting for a modern sewist. However, they are very, very close to the original pattern as far as proportions go, and this seems to be especially apparent in this pattern. My measurements are 32-24-36, and I sized down to the smallest size, based on a 30 bust. The hips are a tiny bit snug, but this sizing down worked out fine for me. Normally, due to my petite size and frame, I have to do a lot of bodice adjustments. However, I didn't change anything out of the envelope when it came to the width of the shoulders and length of the bodice, measurements I usually have to decrease. I'm quite happy with the fit, but this also means that those of you that tend toward a more average proportion may need to double check these before cutting. I'd also suggest checking the wrist and neck circumferences if you choose to make this version. I have what my mother affectionately calls a "pencil neck" and "chicken wrists," meaning they are quite tiny. The neck has just the right amount of room for me when closed with hooks and eyes, and the wrists are also fitted with their cufflink-like button closures. However, I do suggest if you have more average sized wrists and neck that you increase these a bit or move the buttonholes out on the cuffs a smidge. I also have some tips for you when it comes to the sleeve length! I removed half of the length from above the elbow and the other half from right below it. I didn't adjust the curved bottom part of the sleeve hem , so the point comes up higher on my arm than in the pattern illustration. My arm is 19" long from shoulder to wrist, and I made my sleeve pattern piece the same length (not including seam allowances). I figured with the cuff being so closely fitted at the bottom that I wouldn't want much extra length that would cause wrinkles... but it didn't turn out that way. While the sleeves are fabulously full and interestingly shaped, I would make them 1-2" longer next time to fully extend to my wrist bone. I would also shorten the curve at the cuff to preserve the sleeve design lines and make them resemble the illustration more. So learn from me! Make the sleeve 1-2" longer than your arm measurement! Lastly, I shortened the skirt by about 3", as is customary in nearly all my sewing. I retained the mid-calf 30s length to keep proportions correct. You can also see that I did a deep, blind hem. Stupid polyester won't iron properly, otherwise it would really be a blind hem. Grrrrr. The only tricky part I really encountered in the pattern had to do with the skirt vent and the triple pleats in there. Honestly, I couldn't wrap my mind around how they're supposed to be inserted, and I'm still not sure I did it right. However, the pleats make the skirt really easy to walk in while still keeping the iconic slim-hipped, long-lined 30s silhouette. I also ended up stitching the edges of the pleats to keep them in place because the darn polyester refused to be ironed!!! 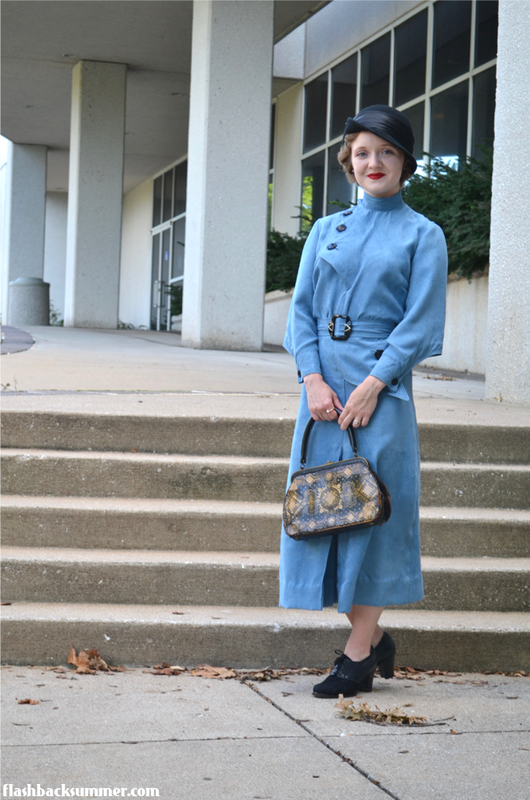 I finished off the dress with five 1930s vintage buttons that look remarkably similar to the sample on the Wearing History website. 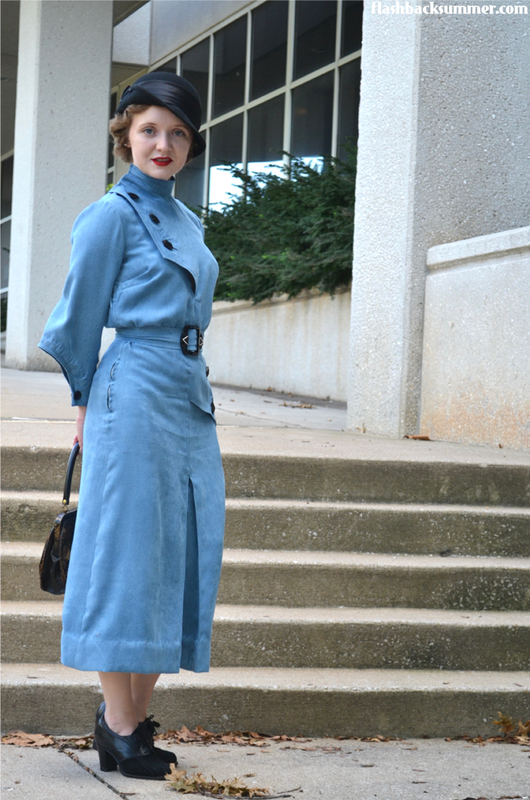 I used mismatched black buttons on the wrists because it's what I've got, and I think that lends a nice Depression-Era accuracy to it. I also tracked down a belt buckle that coordinates pretty well with the buttons and constructed a snap-on belt to match. I really love the mid-30s and happened to have garments to coordinate. 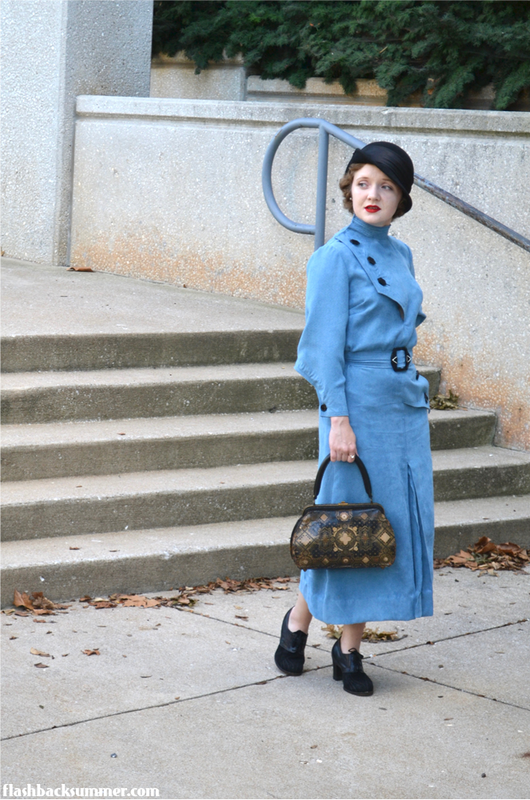 I wore some authentic 1930s heels and carried a fabulous albeit crumbling 1920s purse that melts my heart. For my hat, I took a modern bucket hat/cloche thing I had been given and pinned up one side of the brim with hat pins. 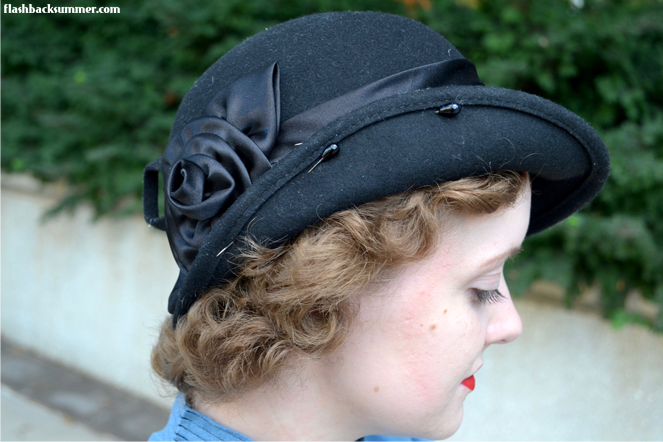 It's not as good as a hat blocked in 1930s style to begin with, but it is a quick way to get the look of the era without breaking the bank. How historically accurate is it? The pattern, obviously, along with the construction are quite accurate to the mid-1930s. The polyester content of my faux suede fabric, however, is absolutely not! Time to complete: about three days. There are a lot of little details and pieces to this pattern, so I'd advise going slow and taking your time! Total cost: The fabric was on sale for $4/yd, and I used about 3 yds, so $12. I won the pattern in a photo contest, and I think the buttons were given to me. The belt buckle was $5, and I'll say all the other notions were $5. Total = $22. Notes: I've gone into great detail above! This is a fantastically unique pattern! Have you sewn this pattern or know of someone else who has? (If so, share a link, por favor!) 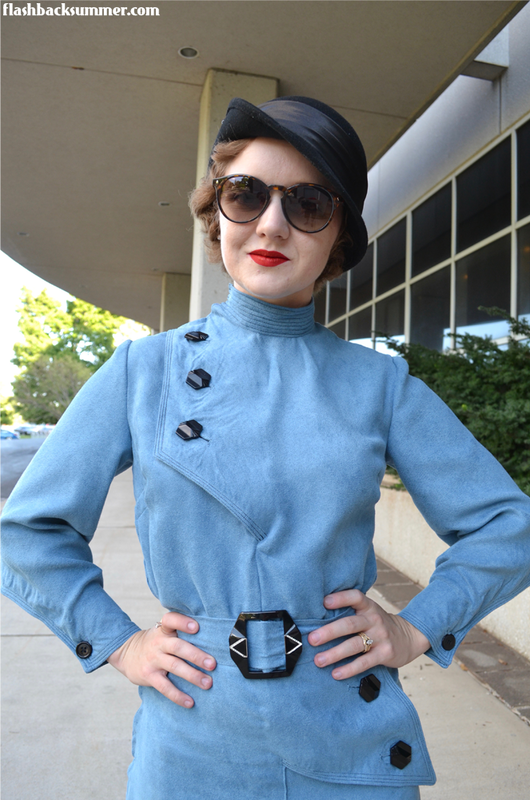 Do you think the Art Deco lines and military inspiration are showing through? Straight out of an episode of Poirot!! Absolutely breathtaking job. I'm in AWE of your skills. 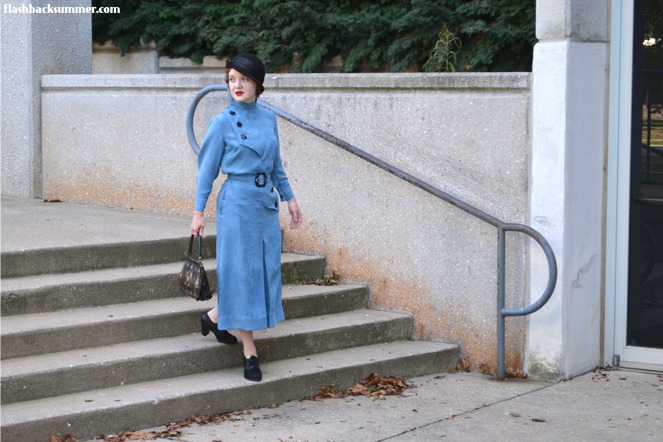 I adore 1930s looks but don't have nearly enough in my wardrobe. This is the kind of dress that I hope to have the skills to make in about twenty years time, once I've followed a long, learning curve! Where is the setting? Looks wonderful. Finally, I LOVE the tip about the hat, I have one that I can do the same to, perhaps even stitch it permanently. Thank you so much, Porcelina! It's actually not too complicated a pattern; it just has interesting details that make it look really unique. I highly recommend it! And these pics are in front of a local performing arts hall. 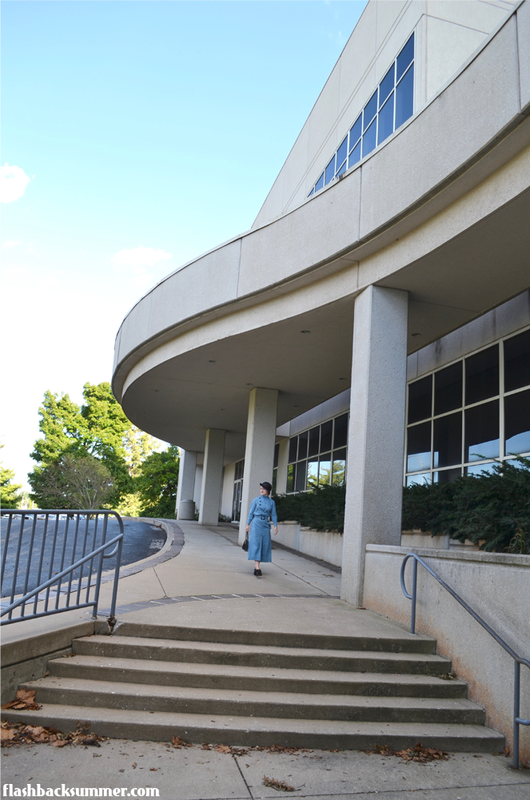 I love the lines on this entrance! Yeah, natural fibers have spoiled me. I can't go back to synthetics without much wailing and gnashing of teeth. Love it! 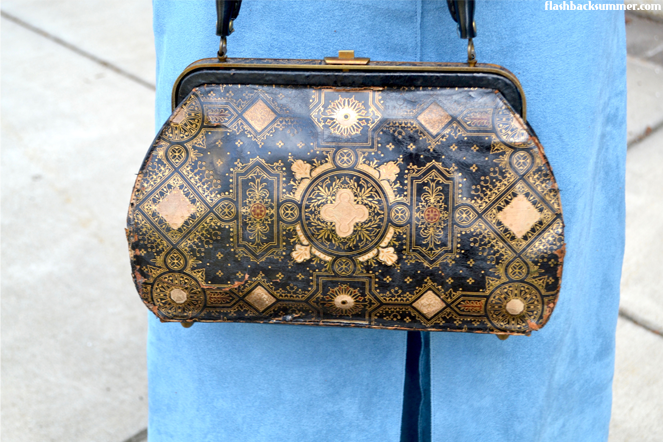 This pattern is so dreamy. More people should make it up! Squeeee! I have this pattern but I made mine sleeveless and with the other neck option. It's summery, but I LOVE your Fall/Winter version. Thank you so much for the tips. I'm saving this for my second go with this pattern. 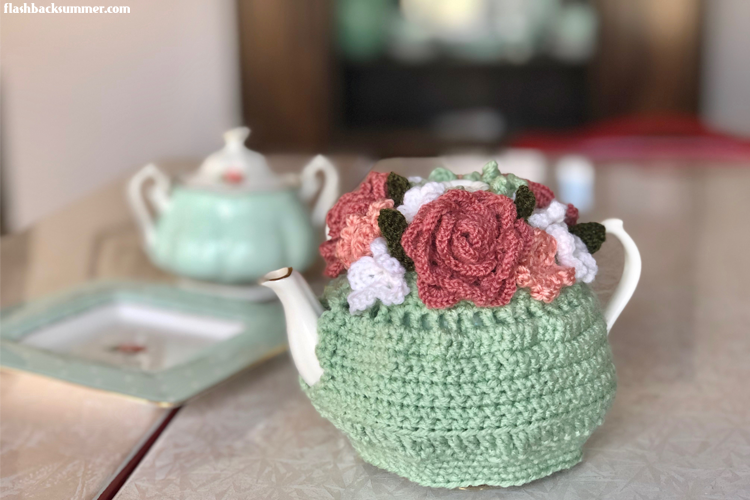 I LOVE the version you made; it was a big factor in why I got this pattern in the first place! I want to make a springy version like yours, too. This is a really cool pattern! I haven't tried any of Wearing History's patterns yet, but I just purchased the trousers pattern to try out. If you are having difficulty pressing seams flat, and getting creases out- plain old white vinegar is like magic! Try using about 3 or 4 parts water to 1 part vinegar. It's worked amazingly for me in the past on all sorts of nasty creases and synthetic fabrics. It works on synthetics?! I will totally be trying this!!! Thanks so much, Nicole! And I love the trouser patterns! (I've tried two of them and loved them both.) 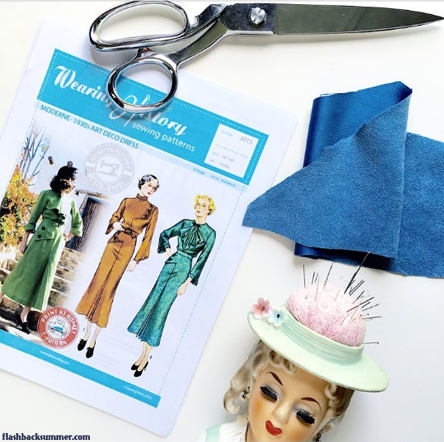 I have posts of both the Smooth Sailing trousers and the Homefront versions, if you want to check out any details before you sew. The details in this pattern are fabulous,and you've done an amazing job, despite the fabric giving you grief! I've spoiled myself with fabric too and I choose to continue doing so! I have so little sewing time that I won't waste it on fabrics I don't love anymore. That is really such a good call. 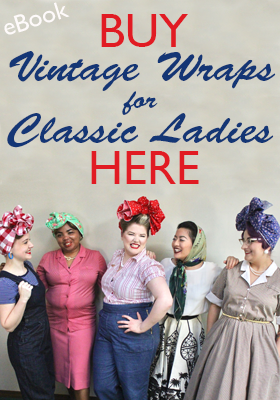 Don't waste precious sewing time on stupid fabrics! Well good! 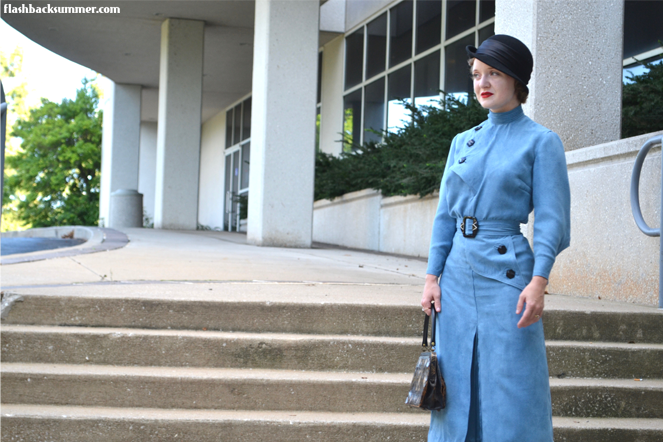 I think there's an expectation to buy perfectly matching notions for every since project, when that really isn't what most sewists in the 30s and 40s were doing anyway. They didn't have funds for such things, and I find things like mismatched buttons, random-colored thread, and make-do piecing in authentic vintage all the time! Such fabulous details! The buttons are magnificent! I've eyed this pattern myself, and now I feel very tempted indeed to give it a go. I have a gorgeous olive wool fabric that would work well. OOOO, this pattern would be FANTASTIC in olive wool! And wool would handle SO much better than polyester; you could make it look really nice and crisp. I'd love to see it if/when you do indeed sew it up! Holy guacamole if you ever wanna sell this I'll be interested!! :p I looooveeee how this looks! But the notions you've picked for the dress are just perfect!!! You look so adorable Em I'm truly jealous of how talented you are!!! Love your attention to details and your precision with fitting! That color is fabulous...so dreamy...your dress should be a lovely way to be ready for cooler temperatures! Do you think the style of high rounded collar and asymmetric closure is a "Russian" or "Cassock" style? 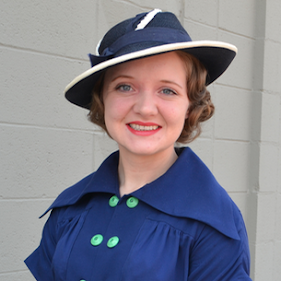 The neckline looks similar to Simplicity #1908 or McCall #276. I think in this case the original designer was inspired by American WW1 uniforms, many of which had high collars like this. But especially with the sleeves it does have a bit of a Russian feel! Wow! Such an amazing dress. I love all the details and your styling of it. You look fabulous. This dress is utterly swoon worthy! So much kudos for making it yourself! It's marvelous! And you look stunning!